That was one of my most audacious predictions, and one that I didn’t expect to happen any time soon. But let’s check where we are one year later. Available at Wal-Mart? Yes, but not electric cargo bikes, just electric bikes in their traditional form, priced between $400 and $800. Still, an electric bike for $400? That’s just unbelievable. Or maybe crazy – the bike has mixed reviews from customers on Amazon. But as far as I can tell it’s not manufactured in China, and surely not designed there, so that part of my vision hasn’t arrived yet. It has been 7 months since I posted my first article mentioning the Trek Transport+. After a very long fall and winter, the bike appears to be available to order. Trek has removed the “available late fall” qualification from their web site, and dealers in my area would be happy to take my order. With a price tag of $2809.99, it’s a little more expensive than the aggressive target of $2679 that was originally announced. It’s also $100 or $200 more than its competitors, the Yuba el Mundo and the Kona Electric Ute, but definitely worth considering for features like the BionX motor and integrated lighting (see my original article for further details). However, my enthusiasm is tempered by the fact that I have never seen this bike, and it’s unlikely that I will in the near future. I’ve inquired at my local Trek dealers (there are quite a few in my area), and they don’t have any Transport+ bikes to show. They can’t tell me when or if they will see one. Reviews of the Transport+ are rare on the web as well. The most complete review I found was from Bike Radar. 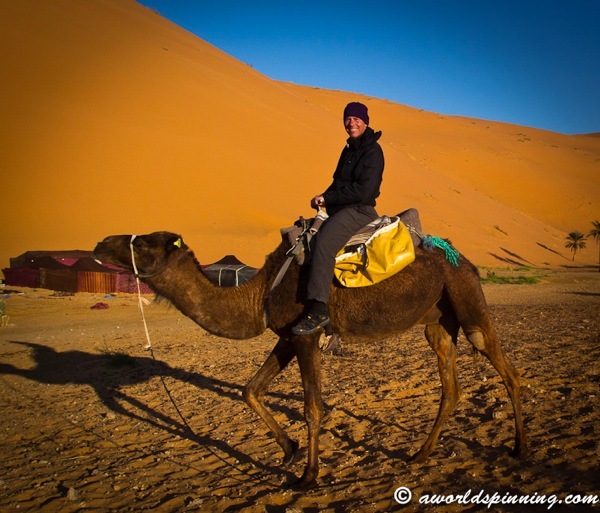 The author loaded the bike and rode it for 6 weeks in a variety of conditions, so that review answered many of my questions. If I were to review the bike myself, I would concentrate a little more on hill-climbing, braking, and range. I’d also check out the handling of the bike with loads that are carried a little farther to the rear than comparable bikes (including my own Rans Hammer Truck). But unless I can make special arrangements with Trek or a local dealer, that opportunity doesn’t look likely in the foreseeable future. I’m both excited and frustrated with this state of affairs. For now, I’ll turn to my readers. If you have any experience with the Transport+, let us know what you think in the comments below. 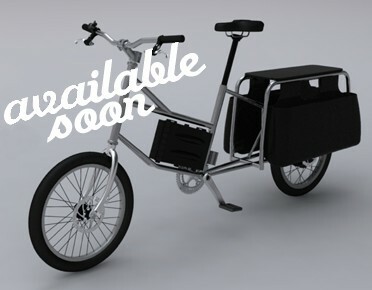 Posted on March 13, 2011 March 1, 2012 Author donCategories Cargo Bikes, Electric BikesTags BionX motor, Hardware details, Practical biking, Trek Transport+10 Comments on Transport+ update: Available. Invisible. It’s also extra-tempting to hop on the bike and enjoy a few moments in the sun as it slinks along the horizon. But be careful of the frost on the road! That’s a lesson my wife just learned the hard way. On the first workday of the new year, she was riding her bike to the bus transfer station. As she approached a turn at the bottom of our hill, she stayed in the center of the road, well away from the frosty edges. Unfortunately, it wasn’t apparent that even the center of the street was polished with a microscopically-thin layer of black ice. Just enough to take down a bike, swift and hard, without a moment’s notice. My wife landed on her hip, shoulder, and head, then slid for several yards before coming to a stop. We’re grateful to report that she sustained only minor bruises. That positive outcome can be attributed to three things. First, in the middle of the car lane, she was well away from the curb and other obstacles that might have complicated the fall. Second, the car behind her was following at a respectful distance, and she didn’t have to worry about it sliding over her. Finally, her bike helmet prevented a nasty bump to the head and kept the pavement from scraping her face. 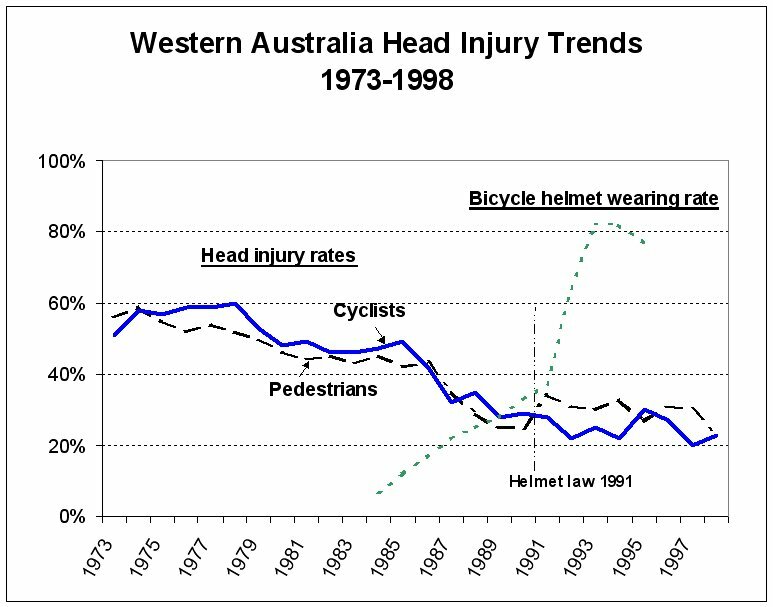 I won’t dwell on this, but the implication is that skyrocketing bike helmet use did not significantly reduce head injuries. And the rate of bicycle injuries is similar to that of pedestrians, who remain unhelmeted in Australia at this time. The other side of the argument (which has been going on for many years) is presented on sites like this one from the Bicycle Helmet Safety Institute. I’m not an expert on this. My family and I have been serious about riding bikes for only three years, and besides my wife’s recent fall, we’ve experienced only one other. That was when I simulated a panic stop with a heavily loaded bike on wet pavement (you can read that bit of foolhardiness here if you’re curious). Our limited experience suggests that bike helmets do more good than harm, and we’ll keep them on. But legally requiring others to wear helmets is a more complicated issue. Given the reduction in ridership that follows mandatory helmet laws, I’m not convinced that there is an overall increase in safety. Having more bikes in the streets increases the safety of individual riders through better visibility, infrastructure, and driver familiarity. I realize that this is a contradiction relative to my opinions about mandatory seat belt laws. Those laws have led to documented reductions in highway deaths. That’s good for individuals and society. On the other hand, helmet laws may save a few individual bonks on the head, but may reduce benefits to society as a whole and bike riders in particular. Until there is a pretty strong case otherwise, I think our default stance should be individual responsibility. The other lesson for my family is that we should stay off bikes when the temperature dips below 37 degrees Fahrenheit. I realize that people all over the world ride bikes in temperatures colder than that (we routinely did so in Copenhagen), but Seattle has some special considerations. Our hills, our minimal bike lanes, and the mixture of car and bike traffic are part of the difference. But perhaps the biggest factor is salt. When it snows in Copenhagen, the bike lanes are plowed even before the streets are (that always amazed us). And then the lanes are liberally seasoned with salt. This has two results: we never slipped during our winter in Copenhagen (admittedly, the 2007-2008 winter was an unusually mild one there), and my bike displayed an appalling amount of rust after only one season. In Seattle, car dealers often make a big deal about used cars that are “local”. You don’t want some rusty hunk of junk from some other state that uses salt, they say. But there’s a very good reason why Seattle doesn’t salt its streets and probably never will: salmon. Adding salt to the already oily brew that washes off our roadways could deliver a potentially lethal shock to young salmon. One might wonder if it’s appropriate to endanger human lives on slick roads for the welfare of fish. Well, if you haven’t lived in the Pacific Northwest, it might be difficult to appreciate the importance of salmon. Fresh salmon are not just an important food (featured in almost every menu of local restaurants), they are integral to our economy, our culture, and our environment. Children study salmon in school, and we celebrate them with community festivals in the fall. The incredible migration upstream to spawn is a metaphor for dedication to a goal in the face of overwhelming obstacles. In the process, salmon deliver literally millions of tons of nutrients from the ocean to our rain forests, enabling a rich ecology that couldn’t exist otherwise. You would think our love for salmon and a generally eco-conscious mindset among Seattle residents would spur us to develop alternatives to car-based transportation. But instead we have endless arguments and litigation. We disagree on the placement of light-rail lines, expansion and tolling of our bridges, replacement of the earthquake-damaged highway which is a blight on the city, and how to fund buses and ferries. There are squabbles between residents, transportation agencies, the legislature, and city councils. I think of this as a testament to the tenacity of our car culture. It has taken over a century to develop our current transportation strategy, and it may take the better part of a century to unwind it. I’m hoping that in ten or twenty years, we will see a visible reduction in the steady stream of cars that crosses a bridge we see from our house. Change at that pace is likely to be appreciated only by the truly patient. I worked in the computer industry for three decades, so I am accustomed to the furious pace of innovation associated with that enterprise. Even so, I have been surprised by the pace of development of electric bikes in general. While competition in the electric cargo bike category has been a little less fierce, it’s amazing that we’ve witnessed three generations of development in a little over a year. 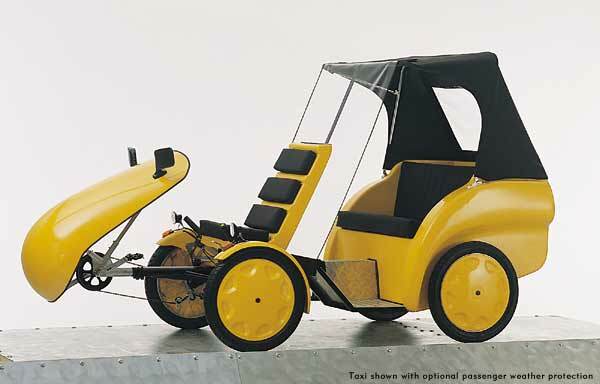 The first generation of electric cargo bikes were do-it-yourself jobs. Customers had to pick a bike and a motor, put them together, and hope the marriage would be a good one. That’s what I did with my Rans Hammer Truck and BionX motor, and as you probably know, I’m pleased with the result. But there are quirks and compromises that I have to warn people about when they take my bike for a test drive. There are issues (like a non-existant gear) that wouldn’t be tolerable on a bike that was manufactured with an integrated motor. 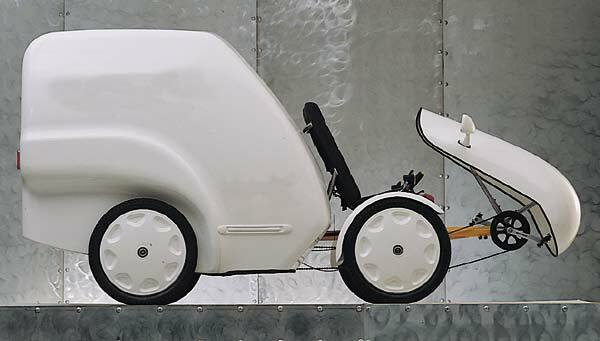 I’ve written extensively about the second generation of electric cargo bikes. 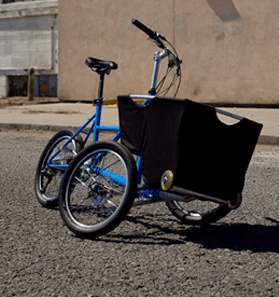 These are cargo bikes that come with an optional motor from the manufacturer, like the Kona Electric Ute, Yuba elMundo, and Trek Transport+. Each of these bikes is available in assisted or non-assisted versions. The motorized versions reduce the guesswork and installation labor compared to the preceding generation. 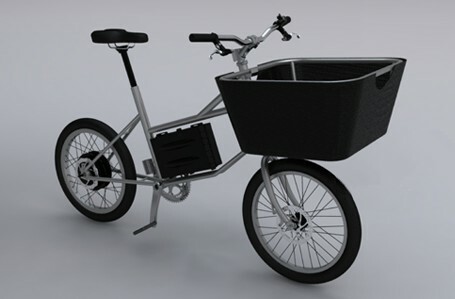 I’ve frequently mused what a third-generation electric cargo bike would look like. What if a manufacturer, instead of adding a motor to a non-assisted bike, decided to start from scratch and design a bike that integrated electric assistance so fundamentally that it defined the essence of the bike? Several days ago, I got my first answer to this question from a Dutch company named Urban Arrow. Let me just say it: I’m very excited about this bike. Just in case my exuberance gets ahead of my experience, I’d like to be clear why I’m excited about it. It’s not just about what the bike is, but what it represents: a preview of where I expected electric cargo bikes to be in another couple of years. If the company manages to sell this bike next year at their current price target, the market is maturing faster than I imagined. Either that or they are a little ahead of where the market opportunity is today. It will be fascinating to find out. I will caveat my remarks by acknowledging that I’ve never ridden this bike or seen it in person. Since Seattle is pretty far from Amsterdam, I don’t know when I’ll have that pleasure. However, the Urban Arrow won an Innovation Award last month at the Eurobike Show in Friedrichshafen, Germany. So at least I’m not alone in my appreciation. I can’t imagine a kid who wouldn’t be thrilled to ride in that cozy compartment. There really isn’t a comparable way to shelter your kids on a longtail bike. The cargo box features a bench seat (which hides the removable battery), 2.5″-thick high density foam for comfort and safety, a grocery net, and even cup holders! The box can be removed to convert into a flat-bed cargo bike, although I’m not sure how simple that is to do. Most front loader bikes are heavy – between 70 and 100 pounds, and that’s without a motor or battery. The Urban Arrow uses an aluminum frame to keep the weight under 100 pounds including the motor and battery. That’s not exactly light compared to the longtails I’ve reviewed, but it’s prepared to handle some serious cargo. The company claims it can carry up to 400 pounds in addition to the rider. As usual, I wouldn’t want to test those limits, especially coming downhill. Although the company doesn’t refer to the angled seat stem and forward pedals as a “crankforward” design, it’s closer to the posture of my Hammer Truck than the other bikes I’ve reviewed. I’ve described the advantages of this design in previous articles, but perhaps the main advantage is reduced step-down height. You can get your foot on the ground while seated without tipping the bike and your cargo too far. The Urban Arrow is assisted by a 250-watt motor manufactured by the German company Daum. In previous articles, I’ve faulted the Electric Ute for using a 250W motor, which I felt was inadequate for carrying cargo uphill. But even though the power rating is the same, there’s a critical difference between these bikes: the Ute has a hub motor, which typically produces less torque at lower hill-climbing speeds. The Arrow’s motor is connected to the crank, and it drives the wheel through the transmission – just like your legs. If the motor is beginning to fade at low speed, you can simply shift to a lower gear to increase cranking speed and get closer to the motor’s optimum torque range. This idea isn’t new. Cargo bikers have been using Stoke Monkey motors to drive their cranks for years. But the Stoke Monkey requires an extra chain to drive the crank, and another extra-long chain to drive the rear wheel of a longtail bike. If you’re the type that likes to lubricate and adjust chains in your spare time, a Stoke Monkey might work for you, but it’s not a solution that is likely to appeal to the mass market. The Urban Arrow’s design avoids another pitfall of the Stoke Monkey: shifting under power. If you’ve opened up the throttle on your Stoke Monkey and then try to shift, you have at least 2 times the strength of your legs ready to grind through your derailleur and gears. The Arrow uses a Shimano Nexus 8 transmission to dispense with the gears and derailleur. Besides easier and more reliable shifting, the Shimano hub allows you to shift even when you are stopped or under load. That makes shifting one less thing to worry about. Eight gears seems adequate with motor assistance. I have 21 gears on my bike, but I only use the top 3 or 4 of them when the motor is helping. However, if you want to carry cargo over hills beyond the bike’s battery range, eight gears might not be enough. The company claims an assisted range of over 30 miles, but I suspect those are relatively flat miles in Holland, not Seattle hills. Battery capacity is 36V at 9.5 amp-hours. Like almost all the electric cargo bikes I’ve reviewed in previous blog posts (with the exception of the Yuba elMundo), motor effort is controlled through a torque sensor which measures how hard you are pressing on the pedals, and then kicks in a proportional amount of assistance. I prefer this method to a manual throttle. Twisting both a throttle and a gear shifter is more than I care to think about when I’m negotiating traffic and road hazards. To comply with European law, the motor is only allowed to assist up to 15 mph. In my opinion, that is a bit conservative, but probably wise. Especially when people are carrying kids, we shouldn’t encourage them to exceed that speed. The drive chain of the Urban Arrow is nicely enclosed to keep it away from clothing and small fingers. It’s a great feature enabled by the internal hub transmission. I would still like to ride a chain-less bike someday, but this is a nice step in the right direction. Assistance level and a wealth of other information is displayed on the large Daum control panel. Apparently, it will even measure your heart rate if you’re riding for fitness. A premium version includes GPS (for a premium price). That could be useful for rental bikes, letting the rider know where they are, and helping the rental company to keep track of their bikes. If a bike is stolen, the GPS unit can tell you where it is via SMS messages. When I saw the first photos of the Urban Arrow, I was excited to see disc brakes on the front and rear wheels. A company representative soon corrected my false impression: the disc-like features on the axles are actually cooling fins for Shimano roller brakes. The company deliberately chose roller brakes rather than disc brakes to reduce the possibility of skidding. Having experienced the dangers of skidding with a heavy load, that sounds good to me. On the other hand, will these brakes handle the long, steep incline that heats my disc rotors to the point of scorching? I don’t think Holland has hills like that, so the performance of these brakes on steeper terrain is still a concern for me. When you look closely at the front wheel, you see something next to the roller brake fin. At first I thought it was a hub motor: it’s nearly the same size as the Ute’s motor. But it’s actually a hub dynamo. It produces electricity as it spins. At first that seemed odd to me – you’re spending electricity on the back wheel to produce electricity on the front wheel. Fortunately, my contact at the company cleared up the mystery. They need the hub dynamo to determine how fast the bike is going so they can keep electric assistance within legal limits. Excess electricity from the dynamo will be used to power the Arrow’s front and rear running lights. For increased safety, I’d be willing to accept a little drag on the front wheel even during daylight hours. I’m not sure what happens at night before you achieve sufficient speed to fully power the lights. I would be tempted to put Down Low Glow light tubes on either side of the cargo box to enhance visibility from the side in the evening. The videos and slideshow below require Flash and won’t be visible if you’re reading this article through my email feed. If you would like to see them, click here to open the article in your browser. The video below shows the Urban Arrow carrying kids. It’s in Dutch with English subtitles. The next video is a review of the bike by a Dutch technology reporter. Unfortunately, it’s all in Dutch with no translation. I included it here because it contains two interesting clips. In the first, the rider performs a U-turn with the bike. That’s one drawback of the front-loader design; the rod that turns the front wheel prevents sharp turns, so a short-radius U-turn requires some back-and-forth. The second clip compares hill climbing with and without motor assistance (he thinks that is a hill?!? :-)) I couldn’t hear any difference between the two, raising my hopes that the motor is as quiet as the company claims. The company is aiming to start selling the bike in the U.S. in the second quarter of 2011 for around $3700. That’s at least $1000 more than the motorized longtails I’ve been reviewing, so that alone might narrow the market for this bike. On the other hand, it’s in the ballpark of similar front-loaders without a motor (like this Bullitt from Splendid Cycles). If you’re looking for a kid carrier, the Urban Arrow would be a good deal at that price. The rain cover will add about $250. Price is just one factor that will determine the success of the Urban Arrow in the U.S. I’ve already wondered how this bike will perform on steeper hills, but there are plenty of places in the U.S. where the landscape is more forgiving. I think the bigger question will be dealer support. If I were going to invest thousands of dollars in a bike like this, I would want a reliable and knowledgeable bike shop nearby who could maintain and repair the bike, when necessary. I’m guessing that few bike shops in this country would be familiar with Daum motors, and although Shimano is a well-known name, experience with roller brakes may also be sparse. I’m hoping that some American bike shops will start selling the Urban Arrow and specializing in its upkeep. A really savvy shop could alleviate customer concerns by offering free pickup of a disabled bike. Even if the bike is your “second car”, getting its 8-foot length into or onto your first car could be a challenge. By way of comparison, loading my 7-foot Hammer Truck into our mini-van is pretty tight, even with the back seats removed. It’s ironic that a bike I’ve never seen has inspired me to write a longer review than one I’ve actually seen and ridden (like the Electric Ute). I’ve never felt comfortable writing about a bike that I’ve only met in cyberspace, but I’ve done it before when I felt it gave a better idea of the range of options and where the market is headed. That reasoning justifies this article because the Urban Arrow breaks new ground in several ways. It’s a harbinger of a new generation of bikes, and I’m excited about that possibility. I hope other third-generation bikes are around the corner rather than years away. If I get a clue, I’ll be happy to let you know. The Urban Arrow is enough of a leap forward, I can’t stop myself from wondering what a fourth-generation bike would be like. In my opinion, the next major advance will be some sort of automatic transmission. As I’ve mentioned in a previous article, truly practical human-assisted transport will isolate rider effort from the terrain. Someday, a rider will pedal at a steady, comfortable pace, regardless of whether they are going uphill or down, and biking infrastructure in our cities will become more accomodating as riders of all ages and fitness levels discover they can participate in this revolution. If nothing else, the Urban Arrow gives me hope that this vision is still achievable and on track. There are many alternatives to haul cargo on bikes – a fact that was demonstrated daily on the streets of Copenhagen during the year we lived there. By far the most popular were Christiania bikes, which were used to haul various daily goods including kids and girlfriends. There were also quite a few bikes with extended front ends, which look a bit awkward but have the advantage of keeping your cargo in view. With such a variety of hauling solutions, the one cargo bike I never saw in Denmark is the one I’ve focused on in this blog: the longtail bike. One might wonder why I haven’t broadened my scope a little. The main reason is my readership. Although my blog is read in many countries, roughly 80% of my readers are in the United States and Canada. Since I’m most familiar with the transportation landscape in North America, I can offer suggestions and opinions that are appropriate here. My experiences in Denmark strengthen my conviction that transportation must be tailored to local circumstances. There are three things that make a Christiania bike a better choice for Denmark than the U.S.: flat geography, advanced biking infrastructure, and higher expectations or education about bikes in general. As I’ve often said, flat terrain is a huge advantage for Danish bikers. The Christiania bike is heavy and not very aerodynamic. I rode one once and it required some effort to push it through a stiff Danish headwind. I’m not sure I could pedal one up a Seattle hill, even without a load. The bike infrastructure in Copenhagen enables a diverse ecosystem of bikes. For example, many bike lanes in Copenhagen are wide enough for one Christiania bike to pass another without impinging on car lanes. Contrast that with my own city, where some bike lanes aren’t wide enough to accommodate a single Christiania-sized bike. Bike trailers represent another cargo hauling strategy that I rarely saw in Denmark. I’m guessing that’s because the added length, the extra wheels, and the location of the cargo farther behind you make a trailer difficult to maneuver in cozy urban settings. But I’ve been getting occasional emails from readers wondering about towing a trailer with an electric bike, so perhaps it is time to tackle the subject. Before I start, I should say that I have never used a trailer, and I’m in the precarious position of expressing opinions that aren’t based on actual experience. I’m hoping that my trailer-towing readers (I know there are some of you out there!) will let me know if I say anything stupid. 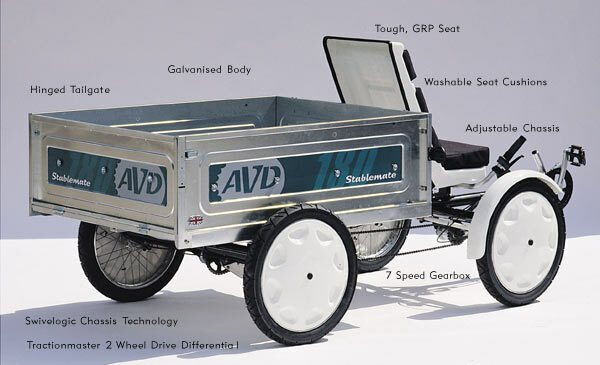 From a price standpoint, a trailer-based cargo bike has some advantages. If you already own a bike, you can buy a nice trailer for about $500. If you were to add an electric motor and lithium-manganese battery for less than $1000, your outlay would be at least $800 less than the least expensive electric longtail bike I’ve described in previous blog posts. So how do they compare on features? The trailer gets points for flexibility. When you’re not carrying cargo, you can enjoy a nice electric bike that’s a little more nimble than a longtail. It will fit on the rack of a suitably-equipped bus – not something most longtails can do. The trailer can also carry heavier or awkward loads due to its longer cargo deck and lower center of gravity. 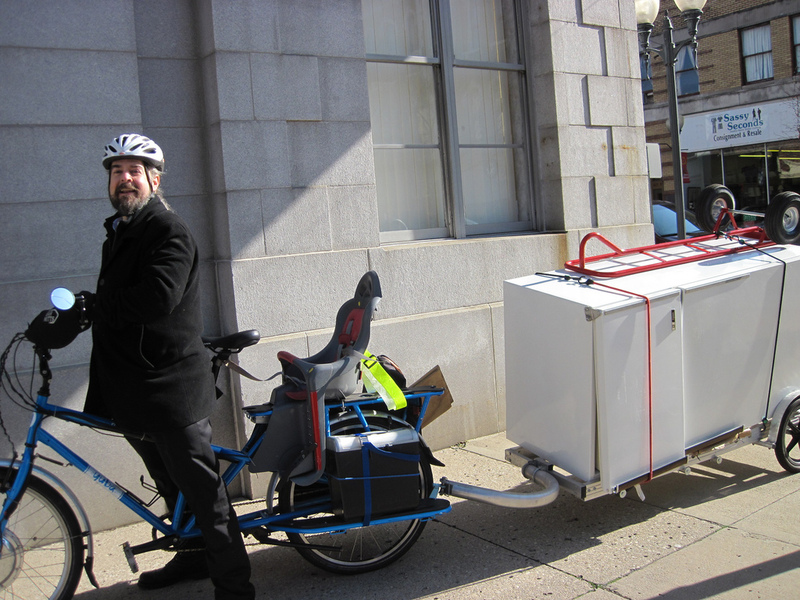 For example, here’s a story of a guy moving a refrigerator using a bike trailer. That’s not going to happen on a longtail! However, if you’re thinking of using your cargo bike for more common daily chores (carrying kids and/or groceries, for example), a trailer will be overkill. It’s not going to be as easy to pack or to ride. The last 3 items on that list arouse some safety concerns. Since the wheels of the bike trailer don’t have brakes, the momentum of your cargo will add stress to your bike’s brakes without adding weight to your wheels. This increases the chance of skidding. As I discovered here, a skidding front wheel radically diminishes steering control. That would be a bad situation on a normal bike, but the bike trailer adds another complication. Unless you’re stopping in a perfectly straight line, the trailer will impart a sideways force to your bike during hard braking. I’ve seen enough jack-knifed trucks to be sure I don’t want to see a jack-knifed cargo bike. What does this have to do with the electric motor? Nothing, except that the extra power and speed provided by the motor will complicate emergency stops. A hard stop at 25 m.p.h. is qualitatively different from the same stop at 15 m.p.h. If my experience is any guide, it’s hard to resist the temptation to open up the throttle when there are no obstacles in sight. Unfortunately, it’s the obstacles you don’t see that lead to emergency braking situations. My gut feeling (again without practical experience) is that bike trailers excel at transporting big loads at moderate speeds over relatively flat terrain. An electric motor would be helpful to get the load moving without shifting through all your gears. Your safety sense must be your guide in determining how fast you allow that motor to propel you. I have one other concern. There’s a reason you don’t see a trailer hitch mounted on a Toyota Prius: the car’s drivetrain isn’t designed for it. Likewise, most bike motors weren’t designed to tow heavy trailers. Even if they work for awhile, the extra wear and tear may not be covered by the manufacturer’s warranty. Anyway, it’s something you might investigate before pursuing this course. If you use a bike trailer, and especially if you’re using a motor, I’d love to hear about your experiences. Today I was sitting in my mini-van, waiting in a pretty long line of cars for a left-turn signal to change. As I waited, I was excited to see an electric bicycle pass me. It wasn’t a cargo bike, but sightings of electric bikes are still rare enough to catch my eye. I watched as the cyclist moved to the front of the left turn line, and I was a little surprised. When I ride my bike to that same intersection, I take my place in the line just like any car would. My surprise quickly turned to dismay. The rider slowed as he approached the intersection, looked both ways, and then made the turn while the light was still red! I know that cyclists sometimes bend the rules a bit, and I can understand the temptation. Coming to a full stop at an intersection requires a lot of gear shifting and loss of precious momentum. Our leg muscles pay so much more for that momentum than cars do. But electric motors ameliorate that. I often execute a full stop/start without shifting at all, because my motor is powerful enough to get me going again in a high gear. To paraphrase Spiderman (how long have I waited for this opportunity?) – “With great power comes great responsibility.” I honestly feel this when I’m riding my electric bike. I take extra care to obey traffic laws, because my life and well-being depends on others obeying those laws. If the driver of a car flaunted the law so flagrantly, I would be tempted to whip out my iPhone and take a photo of his license plate. I don’t know what I would do next, but I feel like there might be some recourse. However, electric bikes exist in this gray area where you can travel almost as fast as a car on residential streets, but you don’t need a license. As a result, there is no recourse for someone who is annoyed with your behavior. They might be tempted to yell at you or crowd you with their car. That doesn’t sound like a recipe for peaceful coexistence on our streets. Perhaps legal regulations will change as electric bikes become more popular. Not that I want additional barriers to electric bike adoption, but it may be inevitable. In the meantime, I want to demonstrate that electric bikers can be good citizens on our shared roadways, and that we deserve respect and consideration from drivers. As newcomers to streets that have been ruled by automobiles for decades, I think we have to earn it.